After reading the devastating article in The New York Times about the 700 immigrants who drowned on their way to Italy from Libya, including 40 children, I felt more pressure than ever to get the word out. 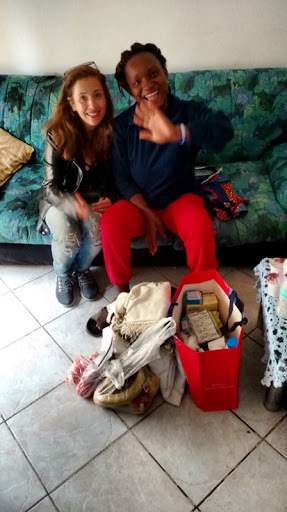 Nadia, the reporter from Il Tirreno, assured me that she would print the story about our experience with Nigerian refugees in Lucca and the marginalized existence that they have been living for the past five years. On a lark I looked up the name of the reporter who wrote the cover story in the Times. He had the same facebook situation as Jim Rutenberg who I met while I was at NYU in that you can follow him, but you can't friend him. I saw that he had a Twitter account, but I have never gone there. 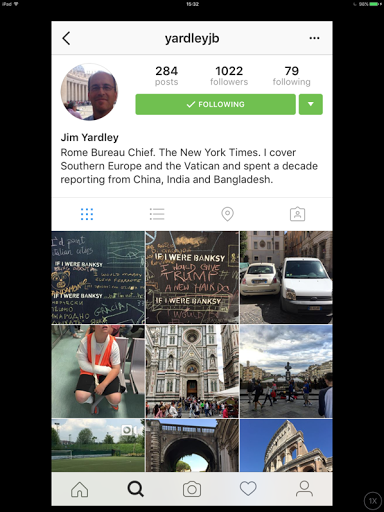 T has however schooled me in Instagram and Tumblr and it seemed that Jim Yardley does like himself some Instagram. Luckily for me, he is a peer age wise, and so his friends are not as cool as he is when it comes to social media. Only three people liked his Banksy upload so I decided to write him a comment. A really long comment about Nigerian refugees. I was pretty shocked when he commented back and gave me his email address. This led to a phone call and a lovely conversation. It turns out his wife works with refugees in Rome. He is in Tuscany observing the commission hearings on asylum as a guest of Caritas. He told me that he thinks the stories of the people in my group might put a face to the harder to grasp, deteriorating situation of the plight of immigrations in the world at large. He has a lovely southern accent and a kind voice, so I am praying that he comes to dinner and meets my group. In the case that he is too busy, I took the liberty of telling our fine food expert Anna Morelli about the coversation so that she could spread the word to every chef in the land. One of the chefs, Iacopo, is supposed to meet with me on Monday to see if he can help us find more jobs for the men in my group. Paul has finally got his contract from the hot food spot Satura and he could not be happier. Good publicity for a good deed never killed anyone. 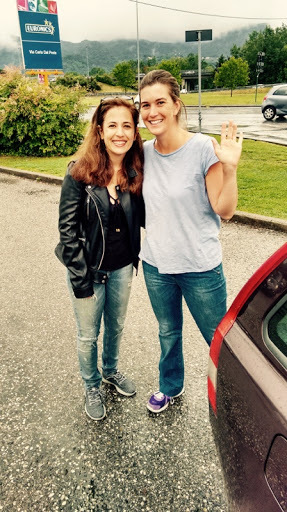 In the meantime, this really amazing woman, Courtney, from the foreigners in Lucca group bought a generous amount of food and supplies to the McDonalds outside of the walls. She had to come all the way from Viareggio in the pouring rain, despite the fact that her own kitchen was filling up with flood water and she had two little sons in the car with her. 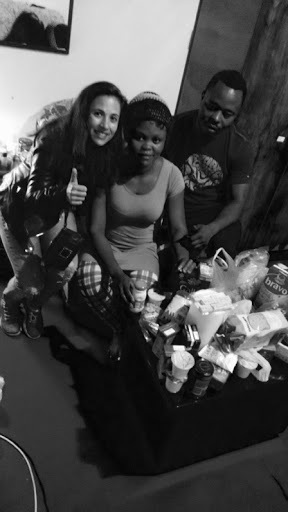 We didn't want the food to spoil so we brought it directly to Tina and Job and to Jennifer and Cool's brother Stanli in Montecatini. The really touching thing was how much a tiny bottle of nail polish means to the women. And the giant smile that a pack of sanitary pads brought. Well, duh. Why didn't I think about how hard life could be as a woman when you can't afford sanitary pads? And, of course, the food will go a long way. Then F did some research and he found out about the mafia capitale, a huge scandal that hit Rome. 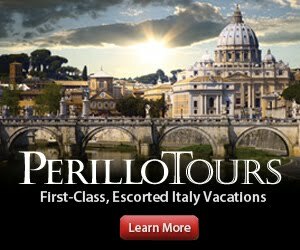 It exposed that the Italian government's program for helping immigrants was being exploited by criminals like Salvatore Buzzi -- who was recorded as saying that he could make more money off of immigrants than illegal drug sales back in the years when the people in my group arrived between 2011 and 2014. 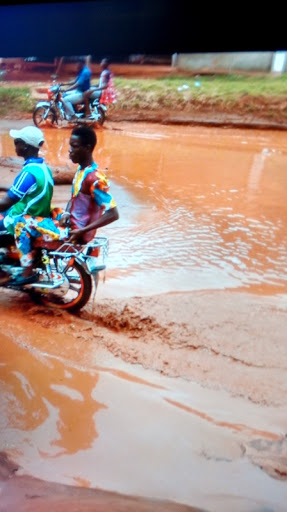 Job shared some photos from his trip home to Nigeria. 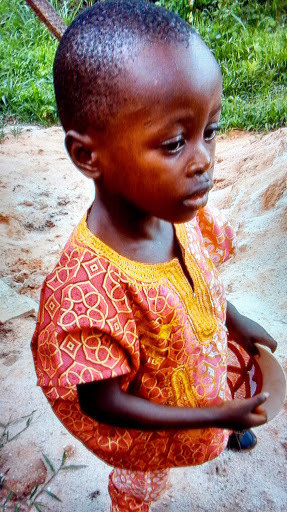 There is an amazing snap of Emmanuel's son Precious. He misses his dad so much. But without papers Emmanuel cannot go back to see him and cannot even send him money. They didn't name him Precious for nothing. . .